Over the last five years, I don’t think I’ve gone longer than a week without hearing about how 3D printing is changing everything. Manufacturing, medicine, gaming, food, you name it. When my wife and I were teaching, our school had a simple MakerBot printer. During my free periods, I often found myself dazed in front of it, staring as objects essentially appeared out of thin air. So when we started our own makerspace, a 3D printer was at the top of our wish list. Sure, even if you don’t have a 3D printer, you can still design models on your computer and order prints from a local library or a 3D printing service, but there’s something about having the process at your own fingertips, and we wanted to offer that experience to our members. 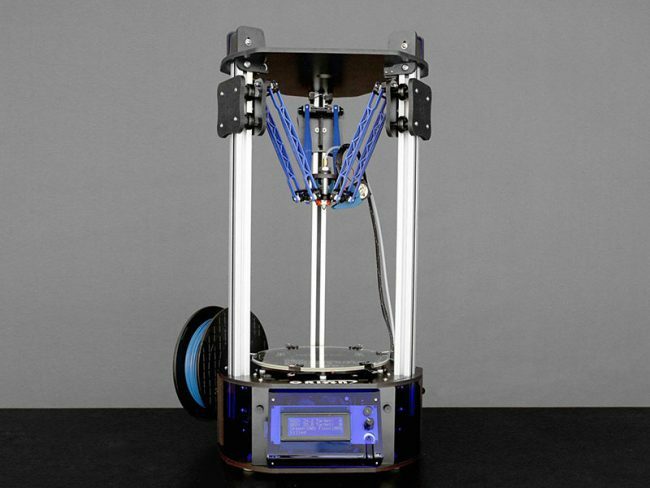 After some research, we ended up purchasing an Orion Delta from SeeMeCNC. The company happens to be located thirty minutes from us, which is nice, but it didn’t drive much of the choice. Rather, most of the decision was influenced by the issues our school had with their Makerbot and our library had with similar models. With a price tag of $1,049, it might be a bit much for the average 3D printing novice to bite off. But it’s well worth it. In most entry-level 3D printers, the extruder is static while the bed moves along the X, Y, and Z axes. The units at the school and library seemed unable to keep moving the bulky bed around. The mechanical elements wore out quickly, which led to imprecise movements and ruined prints. The Orion Delta, on the other hand, has a static bed and a moving extruder. This lighter load seems to give it a bit more endurance in the long game. Instead of a simple X and Y axes, the lateral movements are split across three equidistant posts. I’m not smart enough to know if this makes the printing more precise, but if someone told me, I’d believe it. The print bed is circular, which makes for a great looking machine. It has a maximum print size of 9 1/4″ high with a diameter of 6″, which is respectable for a machine this size. For the complete beginner (read: me), there’s going to be some sort of learning curve no matter what 3D printer you use. It’s a little bit like learning a new language. But the SeeMeCNC makes it as easy as I imagine it can be. Even when I was walking through the sensitive calibrations before I could use the machine, I didn’t feel like I was in over my head. The easy-to-read LCD screen and simple turn-and-push knob were easy to navigate. Similarly, printing was a breeze, once I figured out how to design a 3D file. When you load the SD card into the machine, it automatically pulls up the SD card menu. From there, you simply select the filename, push the knob, and let it print—assuming you prepped the file correctly (I still have trouble sometimes). After just a couple short days of googling beginners guides and finding files, I had printed a small collection of pop culture figures, mathematical models, and sharks with big muscly arms. A week later, I was teaching other people how to use it. While I wouldn’t exactly say I’m a 3D printing expert, I’d like to think I’ve put this printer through its paces. Most of the problems I’ve run into have been due to user error, bad files, or problems with cheap filament. The Orion Delta itself has proved itself a capable machine, printing with precision and detail. I won’t claim that it’s the most sophisticated machine on the market, but I do know that when I printed a miniature bust of Tedd Roosevelt, his facial features were still identifiable. There have also been a few times where I have used it to make small replacement parts, and it didn’t have any noticeable issues recreating those pieces with accuracy. Even after becoming familiar with this machine, I feel like I’ve just barely tapped its potential. Hundreds of prints in, it feels like I’ve just barely scratched the surface. The SeeMeCNC Delta Orion retails for $1,049 and it is available on SeeMeCNC’s website. Nathaniel FitzGerald is a longtime audiophile and independent musician living in South Bend, IN. He has been collecting records and vintage stereo equipment for over ten years. He also runs a blog called A Year of Vinyl, where he reviews every record in his (sizable) collection one disc at a time.